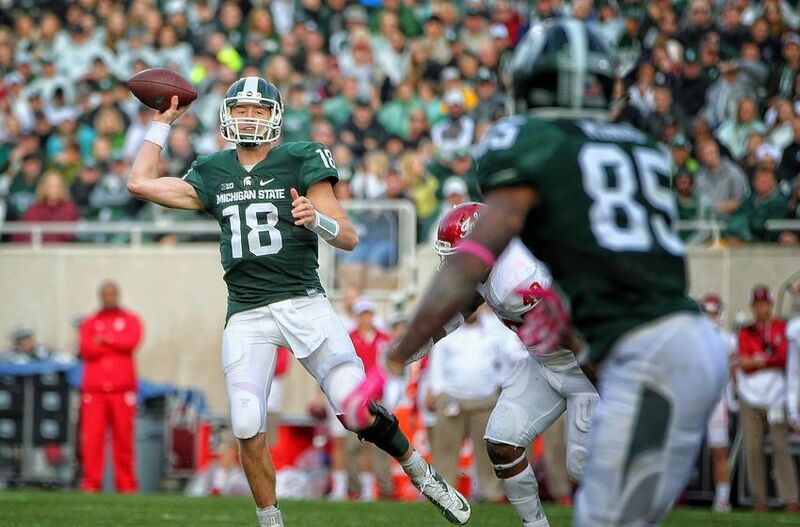 The health of Michigan State quarterback Connor Cook could be a big factor in their Cotton Bowl game against Alabama. The biggest college football games of the season are here! The six major bowl games will run on December 31-January 1, with the two biggest—the Playoff semifinals situated within the New Year’s Eve schedule. Whether you wager or simply want to watch, our job is to have you ready. With that in mind, we’ve compiled the “Tale of The Tape”, a concise snapshot of all six games. It’s not comprehensive—if you actually plan to bet, this is a starting point not a finishing point. But it will provide the framework for an enjoyable (and profitable, if you’re so inclined) run of watching games. *The basics of W-L record and most importantly, strength of schedule. The latter has to be a significant factor in how you weigh every other piece of data. Some of us rely on complex computer models to do it, others just keep it in the back of their mind. Just make sure you keep it in mind. *Each team’s national ranking on offense and defense, as measured by points allowed. *The basic stats of each team’s quarterback—their completion percentage, yards-per-attempt and TD/INT ratio. *A notable player on the team besides the quarterback—usually an elite running back or defensive playmaker, and occasionally a wide receiver. Comment: It will be Maguire at quarterback for Florida State, with Everett Golson not making the trip to Atlanta. The balance of Houston both offensively and defensively gives them a shot at an upset, but the concern is that the offense is so heavily reliant on Ward that the excellent FSU defense may be position to dominate the football game. Comment: Those talented Clemson defensive ends need to win their battles or it will be long day for the Tiger secondary given how hot Mayfield is. The bigger area of concern for betting Oklahoma is the question of how much those dazzling offensive numbers are a product of playing in the wide-open Big 12 and the tendency of high-stakes bowl games to be a bit more conservative.